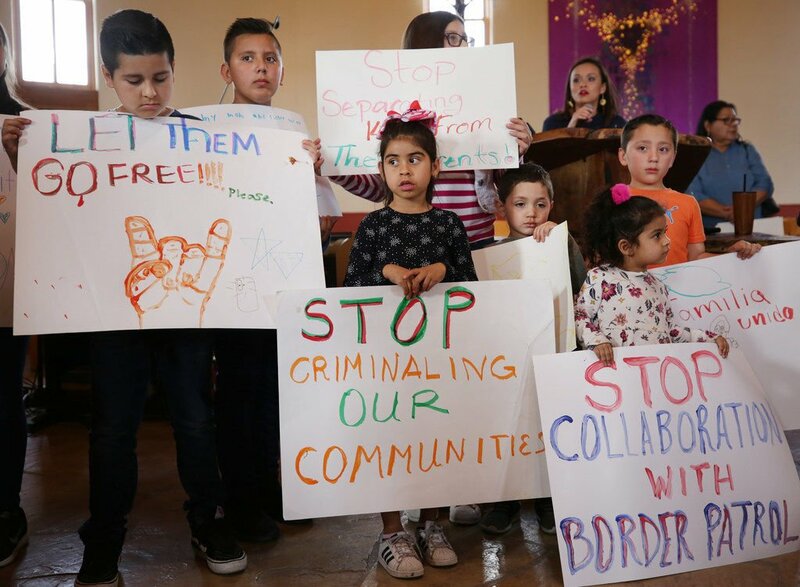 Children show their support for a family arrested by the Border Patrol. TPD officers were present during the arrest. Under a proposed initiative, Tucson police would not be able to assist border agents in detaining undocumented immigrants. 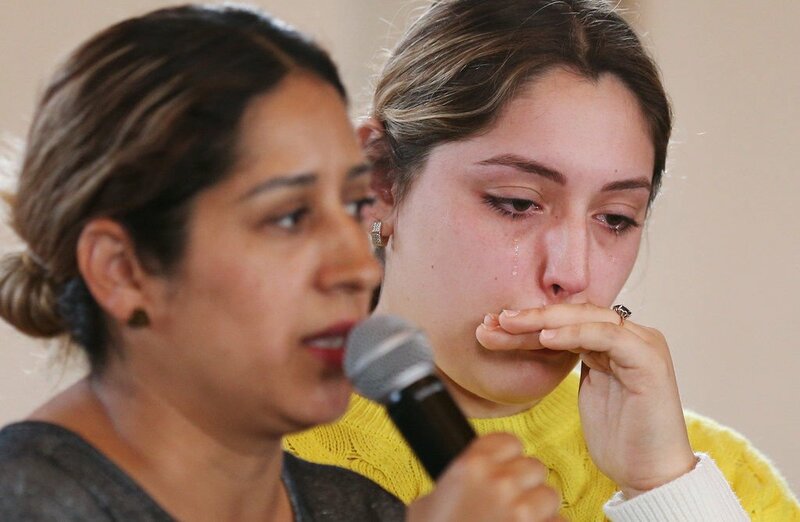 Paulina Ramirez, right, sister-in-law of Jesus Antonio Torres, who was the arrested with his family Tuesday after a traffic stop, and family friend Dennice Sanchez, left, were among those showing support for the family at a news conference. In a Tucson video that went viral last week, a state trooper pulled over a Mexican immigrant couple and their 12-year-old daughter in their vehicle and called in the U.S. Border Patrol who detained the car’s occupants. The pretext for the stop was that the vehicle’s windows were too dark and the three people were taken in because of immigration violations. Yet the video also showed that Tucson police officers were present. Although it was a DPS officer who initiated the stop and called in immigration agents, it did not appear that Tucson police were directly involved in the highly publicized incident. But to many people, including myself, the presence of Tucson police was disturbing. It was yet another reminder that TPD continues, indirectly or directly, to be seen as a partner of Customs and Border Protection agents. Tucson police would probably argue they were present as a precaution or because activists had appeared at West 22nd Street and South Ninth Avenue to witness and document the stop and detention of an immigrant family. One protester, who placed himself underneath a Border Patrol vehicle, was detained by Border Patrol. However, the fact that Tucson police were visible during the stop, in a Mexican barrio where police should be seen as independent of the Border Patrol, is troubling. Too many times, police and immigration agents work in tandem in the barrios and there are no witnesses taking videos with their smartphones. It should not have to be this way. This is why I support the effort to make Tucson a sanctuary city. “All they (Tucson police) are doing is participating in the apprehension of immigrants,” said Zaira Emiliana Livier, director and co-founder of People’s Defense Committee which is leading the campaign called Tucson Families Free & Together. Supporters are seeking to secure 9,000 qualified signatures by July 5 to place an initiative on November’s city election ballot that would make Tucson, a sanctuary city for undocumented immigrants. Now let’s get this out of the way: Sanctuary does not mean that undocumented immigrants would become legal residents. Sanctuary does not mean that undocumented immigrants could legally work or avoid arrest or evade deportation. Undocumented immigrants will remain subject to federal immigration laws. State troopers and Pima County sheriff’s deputies will continue to be complicit as immigration agents. Under the initiative, among its provisions, Tucson police would be prohibited from asking a person’s immigration status in hospitals, churches and temples, courthouses, in addition to schools. The initiative would keep police from relying on “certain racial stereotypes” to determine a person’s immigration status and sanctuary will keep police from checking a driver’s and passengers’ immigration status while conducting traffic stops. The initiative would require Tucson police to read a person their Miranda rights (you have the right to remain silent, you have the right to have a lawyer) before being questioned about immigration. And police could no longer arrest people for illegally entering the country. Sanctuary would benefit all of Tucson, not just undocumented immigrants, said Billy Peard, staff attorney with the American Civil Liberties Union of Arizona and one of the authors of the initiative. For example, under sanctuary, immigrants, regardless of their immigration status, will come to trust Tucson police will not function as immigration agents and that Tucson police will protect them when they need to be protected. Sanctuary will give undocumented immigrants, who are crime victims or who could be helpful in finding criminal culprits, confidence that they will not end up in the hands of immigration agents. This, said Peard, would go a long way in helping Tucson police fight crime and result in more robust crime detection. “We will be able to reside in a community that rises and falls on the well being of the whole community,” said Peard. Tuesday’s stop and detention is not an isolated case, Livier said. Families’ lives are being disrupted and torn apart as immigration agents, with the cooperation of local and state police, are detaining and deporting people. According to Livier and social media postings, the three family members detained on Tuesday were released by Border Patrol on Thursday. Immediately after the husband was detained again and deported to Nogales. Supporters of sanctuary believe that Tucson, as a city, can empower itself, and cannot wait for political leaders from the local level to the state to act. Initiative drive leader makes the eloquent and forceful case.